BOSTON--(BUSINESS WIRE)--Digital experience company Acquia today announced the winners of the 2018 Acquia Engage Awards. 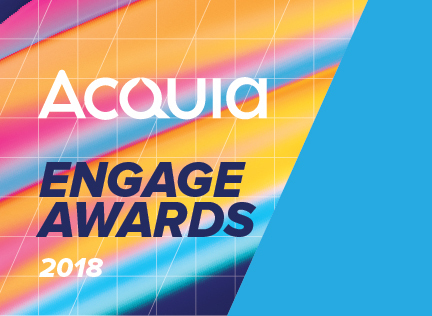 The Acquia Engage Awards recognize the world-class digital experiences that organizations are building with the Acquia Platform. More than 100 submissions were received from Acquia customers and partners, from which 15 were selected as winners. Nominations that demonstrated an advanced level functionality, integration, performance (results and key performance indicators), and overall user experience advanced to the finalist round, where an outside panel of experts selected the winning projects. “Each winning project demonstrates digital transformation in action, and provides a look at how these brands and organizations are trying to solve the most critical challenges facing digital teams today,” said Matt Heinz, president of Heinz Marketing and one of three Acquia Engage Award jurors. Sheryl Kingstone of 451 Research and Sam Decker of Decker Marketing also served on the jury. Leader of the Pack - Financial Services: Paychex, Inc.
Winning projects will be featured at the Acquia Engage in Austin, Texas, throughout the conference. Winners and finalists attending Acquia Engage will be invited to an exclusive executive breakfast on Thursday, Nov. 8. Acquia provides a cloud platform and data-driven journey technology to build, manage and activate digital experiences at scale. Thousands of organizations rely on Acquia’s digital factory to power customer experiences at every channel and touchpoint. Acquia liberates its customers by giving them the freedom to build tomorrow on their terms.